A dog safety water vest is a simple and inexpensive way to protect your pooch around swimming pools, lakes and the ocean. Don't leave your dog at home when you and your family are planning to enjoy water sports; bring your pet with you! A dog safety water vest protects your pet in the same way that it does humans. Water vests keep your pet's head above the water so that it does not drown, even when the animal becomes exhausted. When the vest is put on a pet properly, the vest's design will keep the animals head above water. Pet water vests come in all sizes and colors to fit the tiniest pooch to extra large dogs. Where Can I Take My Dog Swimming? The design of a dog safety water vest is slightly different from those that a human uses. The goal is the same though; keep the head above the water, even if the rest of the body becomes totally relaxed and becomes vertical with the head. The careful design of these vests is very important; the owner must be able to adjust the vest correctly since the pets cannot do it for themselves. Measurements - Measuring your dog in the right places will assure a proper fit of the safety vest. Your dog will need to be measured around their chest (right behind their front legs), and from the chest to the tail. Copy these measurements down, as they will help you select the right size when ordering online. Adjustable Straps - If your dog is between sizes that are offered, you will want to order the larger of the two. It is important to order a water safety vest that is fully adjustable so that you can get the proper snugness needed. If you order a vest and find that your dog easily slips around in it, even with all of the straps adjusted correctly, return it. A safety vest won't protect your dog if they can wiggle or be pulled out of it in rough waters. Buckles and Straps - Buckles made of plastic are the most common in water safety vests since they will not rust or corrode. However, these buckles must be checked before each outing to make sure they haven't been broken or cracked. Velcro is another popular method of securing straps, however in order to be the most effective, the strips of Velcro should be long and wide. Short, one-inch lengths of Velcro may not always hold, especially in rough water. Materials - The material used to construct your dog's safety vest is of great importance. Cheap materials used to make your dog look fashionable aren't necessarily functional. Fabric made from 600 denier nylon is very durable and a good choice when selecting a safety vest. Neoprene bellybands are also very desirable, but vests made with this material should not be washed in bleach, as it will disintegrate the material quickly and reduce the snug fit that you need. Extras - Desirable extras in your dog's water safety vest include reflective strips, neon orange or yellow colored material and a handle sewn on the back of the vest. Reflective strips can help find a dog at night in the water, and neon colored material makes it easier to find animals in the water during the day. A handle sewn securely to the back of the vest makes it easy to grab a dog by hand, or by using a boat hook. While purchasing a cute water vest may make your pet look nice on the beach or around the pool, their life is always at stake. 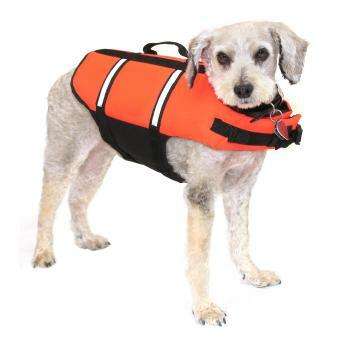 Choose vests that are functional so that your dog has a chance at survival if they should fall into a swimming pool unnoticed or go overboard on boat outing.